Are you shocked to see me? 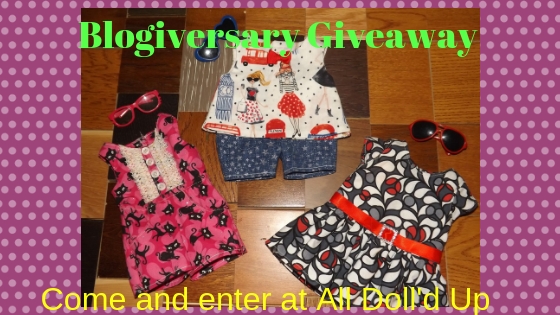 My AG dolls are usually the ones to do this sort of thing, but it's our blogiversary! So I kicked up the guts to step in front of the camera this time! You now know all my secrets, what I look like, that I'm tall, that fried chicken is amazing! You should feel special that I tell you so much. Anyway, as you may have read in my last post, it's ADU's first blogiversary, so I really wanted to do a giveaway to celebrate. A set of three outfits! The set includes a top and shorts set, a jumper, and a fancy dress! The top and shorts set has a flared tank top with a little bow up by the neck line. And Velcro's up the back. I hear this so often in the blogging community... You can never have too many pairs of jean shorts! So I thought it would be good to include some in the giveaway! These are made of jean fabric with little stars and swirls on them. They have real pockets on each side of the front. And also Velcro's in the back. This outfit also includes a pair of blue heart shaped sunglasses. With lace and buttons up the front. and pink glasses to match. Last but not least, the fancy dress comes just above the knees. So one more time, one jumper, one top and shorts set, one fancy dress, and three pairs of glasses/sunglasses. On to the rules (because what is fun without the rules? ), how to enter, and how to get extra entries! You must have a parent's permission if you're under 18. Because if you win I'll need your address. I'm sorry, but I can only ship to the USA and Canada. Comment down below telling me that you'd like to enter, that you meet all requirements, and where you found out about this giveaway. Share about this giveaway, you can share this on your blog (if you share this way you can use the post banner at the top of this post) or comment on someone else's blog about it. If someone finds out about this giveaway through you. So if some comments that they found out from you or your blog, you shall be rewarded. Tell me in the comments what's your favorite post to appear on All Doll'd Up. P.S. Make sure when you accomplish these to let me know! Best of luck everyone! The last day to enter is midnight, Sept 29th. And the winner will be randomly drawn on Sept 30th. Thank you again for your continued support! Have an awesome day! Oooooh, I'd L-O-V-E to enter! I have parental permission, and I'm following you ;) Happy blogiversary! Yay! You're entered! Thank you so much!! Yay!! I definitely am entering! I have parental permission, and I am a follower of this blog. Extra entries!! I love your photo stories, and just so you know, I'd love to see one with Josefina in it! https://lifeoffaithbyhap.wordpress.com/2018/09/15/go-enter-this-awesome-giveaway/ I posted about it on my blog. Also, if me and my sisters post about it on our blog does it count for all of us? (and can I enter twice for that category?) If yes, another entry, please. If no, don't enter any of us! Thanks so much, and congrats again! Awesome sauce! Ooooooooo cool! Yes! I'll definitely try to include her in one soon :) great! Thanks so much! Yes! If you post on your doll blog it would count as an extra entry for each of you, are your sisters entering too? If so, that's 4 entries for you, 2 for Emily, and 2 for Abbey :) thank you SO much! And good luck! Hi, I'd like to enter. I have permission, and I am a follower of your blog. I like your photo stories, also, and we posted on our blog about this giveaway. Hi Abbey! Awesome! You're entered :) you have 3 entries! Awesome Katie!!! I would like to enter I found out about this giveaway by going directly to your site (Oh, and from your previous post), and I meet all the requirements. :) For a bonus entry: There are so many great posts... It is so hard to choose, but I really like your how to fix an AG doll part one. Thanks for doing this, Katie! Hi Katie! I'm so excited to enter in this giveaway! I have permission from my parents and I follow this blog. for extra entries, I really like your photo stories. Also, me and my sisters posted on our blog about your giveaway. Hey Emily! Yay! I'm so glad, I worked really hard on all the outfits so it makes me so happy to hear you're excited :) Sweet! You're entered! You have 3 entries, Good luck! Thank you The Human!! Awesome thank you so much, you're entered and when you share you'll have 3 entries! Yay!! Awesome! Oh no problem, thanks for being an awesome follower! I'm so glad you enjoyed that one! I love the song and movie, plus Avery's personality is based off Ash :) ok then, you have 2 entries! Best of luck!